by Msgr. Stephen M DiGiovanni H.E.D. March 12, 2017 will be the 17th anniversary of the passing of Cardinal Kung in exile here in the United States. 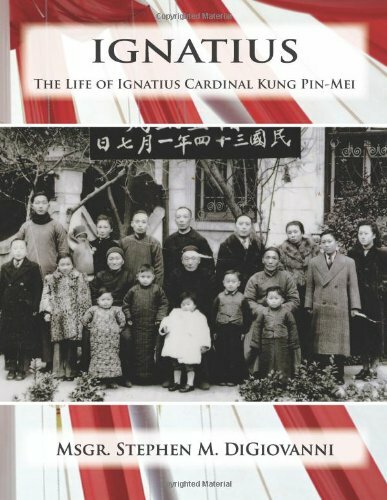 To honor Cardinal's life and ministry, effective immediately and until the end of March, the book, "Ignatius, The Life of Ignatius Cardinal Kung Pin-Mei"is offered at $5, a 50% discount. You may purchase it through the Foundation's Donation page or sent your request directly to the Foundation PO Box enclosing the check. A $10 shipping charge for each book will be added for shipping overseas by regular airmail. I believe that you will be inspired by Cardinal Kung's life and his episcopal ministry brought forth by the author, Monsignor Stephen DiGiovanni, S.T.D. through his extensive research and scholarly insight. This book is easy reading and will make a great gift also for a student, for Confirmation or a homeschool group. Ignatius Kung Pin-Mei (1901-2000), a simple Chinese-born Roman Catholic priest and first native-born Bishop of Shanghai, led his people to bear witness to Christ in the world. For his unflinching loyalty to the Pope, the Successor of Saint Peter, he endured more than thirty years imprisonment at the hands of the Chinese Communist government. Throughout, Bishop Kung stood squarely to defend his position that he was a loyal citizen of his homeland. He loved China: he was born in China, grew up in China, and ministered as a priest and bishop in China; and it was in China that he hoped to die and be buried. His life of humble witness was not as an enemy of his homeland, but as a Chinese citizen who was also a faithful Roman Catholic, in communion with the Pope. His is the same claim as that of other witnesses to Christ throughout the life of the Roman Catholic Church: one can be both a faithful Catholic and a faithful citizen. This is his story. Monsignor Stephen M. DiGiovanni was born in Arlington, Massachusetts, in 1951. An alumnus of the Pontifical North American College, he was ordained a priest in 1977. He received his doctoral degree in Ecclesiastical History (H.E.D.) in 1983 from the Pontifical Gregorian University. As a priest of the Roman Catholic Diocese of Bridgeport, Connecticut, Monsignor DiGiovanni served in various parishes as a parochial vicar; was the diocesan historian; and was the founding rector of the Saint John Fisher Seminary Residence and Vocation Director of the Diocese. He has served as the Pastor of the Basilica of Saint John the Evangelist in Stamford, Connecticut, since 1989.